seal lengths – multiple colors in stock. The cinch-up, adjustable Tug Tight Plastic Security Seals are ideal for situations requiring varying security seal lengths. The one time use Tug Tight Plastic Security Seals are a tamper evident pull-tight adjustable security seal that allows the user to cinch-up the security seals according to their specific size requirements. Two sizes: 12in and 18 in. EZ Loc Cable Security Seals are a medium-duty cargo security seals featuring non-preformed security cables that fray when cut with various marking options for customized tracking. 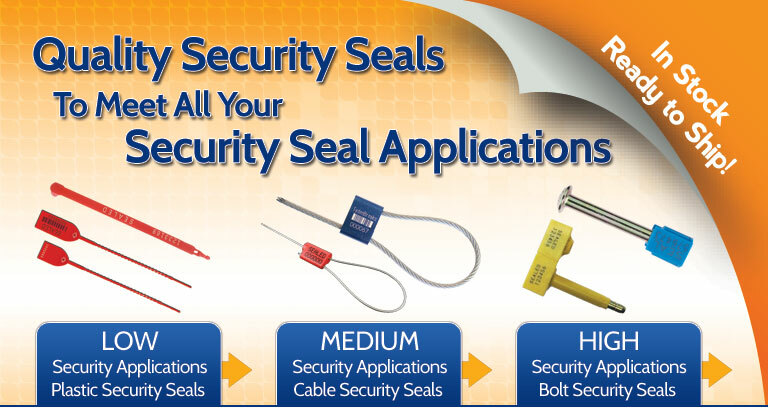 Our Cable Security Seals provide you with the measured security you need. EZ Loc Cable Security Seals are CTPAT/ISO 17712 compliant***.